Hello. My name is Rodney Everson. For over a decade, I have provided private phonics instruction to hundreds of struggling readers, many of whom were quite intelligent despite their difficulties with learning to read. During that time I developed a comprehensive advanced code phonics program that I used with every child, regardless of age. I also drew some conclusions that you might find both surprising and encouraging if you are a parent of a child who is having difficulty reading for no apparent reason. 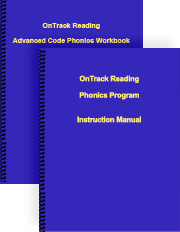 The workbook covers all of the phonics that your child needs to know while simultaneously building the particular skills needed for reading, such as efficient blending, segmenting, and testing of alternative sounds. In addition, the workbook contains a unique multisyllable curriculum that will quickly have your child accurately decoding longer words rather than guessing at them based on their beginnings, endings, and word length. You will not find a better method to teach a child to efficiently decode multisyllable words. Frankly, the advanced code workbook described above is so inexpensive that it's probably worth trying it out first, especially if your child does poorly on the phonics tests described on the page Phonics Workbook Expectations. In the meantime, you can be considering whether to address other possible issues discussed here. As for the alternate route, you might already have tried one or two phonics programs, yet your child is still struggling with learning to read, or just can't seem to be able to read fluently and easily. If that's the case your child's problem might not be the instruction he's getting, but whether he is developmentally able to absorb that instruction. After more than a decade of working with children with obvious reading problems, whether they were diagnosed as dyslexic or not, I've found that many children who struggle with reading are fighting undiagnosed, and therefore untreated, vision problems of one form or another. Nutritional issues might even play a role in triggering those vision problems. If you'd like to pursue these avenues, the place to start is Understanding the Dyslexia Puzzle. In particular, be sure to read The Vision Piece of the Dyslexia Puzzle. During the design of the OnTrack Reading Advanced Code Workbook, I developed a database that I could use to locate words that contained specific sounds and spellings so that the word lists in the workbook could be efficiently structured. I've made those word lists available, free, on this website. So, if you're a parent or teacher looking for lists of kid-level words for whatever purpose, take a look at the 101-word lists constructed from a 7,000-word database based on a children's dictionary, and organized by either vowel sounds or consonant spellings. You can find them under the Comprehensive Word Lists tab. An introduction to the unique, highly effective, OnTrack Reading method for attacking long, unfamiliar words chunk by chunk. The place to start if you're concerned about a child struggling with learning to read. Details of an actual school-based vision therapy program that ran for six years in a small school district in Wisconsin. After fixing a reading problem, the remaining challenge is to convince your child that he can, indeed, become more intelligent. Dr. John Cannell's theory of autism is discussed along with its possible relevance to dyslexia. Shows you how to use kid-level logic to teach your child what the vowel sounds are; you might be surprised yourself. Ms. Romalda Spalding, long ago, developed the best way to teach a child to distinguish b from d; it worked with every child I taught.